Homemade fresh smoothies are all you need to fight hot summer days, and we have picked the easiest recipes for you! Prepared with 4 ingredients only, they are all super easy to make and guaranteed to please! For a rich creamy smoothie, blend 2 frozen bananas, 2 cups whole fat milk, half cup American Garden creamy peanut butter and 2 tablespoons of honey for about 30 seconds until smooth. This recipe is totally worth trying, and it’s perfect to serve to your kids next to some chocolate chip cookies as an afternoon snack. If you’re craving for chocolate and looking for a refreshing smoothie at the same time, you can try the following recipe: blend ¾ cup frozen yogurt with 2 tablespoons unsweetened cocoa, half cup almond milk and 1 tablespoon honey. Don’t hesitate to add some dark chocolate shavings on top just before serving. To all those who enjoy the taste of fruits in a smoothie, this recipe is for you! Combine in a blender half cup of fresh strawberries, 4 vanilla ice cream scoops and 2 spoonful American Garden strawberry topping and filling. Blend for 1 minute then pour the mixture in 2 glasses drizzled with American Garden Strawberry syrup and serve immediately. Enjoy each sip of this refreshing drink with your favorite cake recipe! For a colored refreshing smoothie, start by blending 1 ripe avocado with half cup milk and 2 tablespoons honey. Pour the mixture in serving glasses and leave aside. Clean your blender; add a cup and a half of fresh strawberries, half cup milk and 2 tablespoons honey. Blend well then pour the mixture over the avocado layer. Do not forget to add some drops of lemon juice over the avocado to preserve its green color. 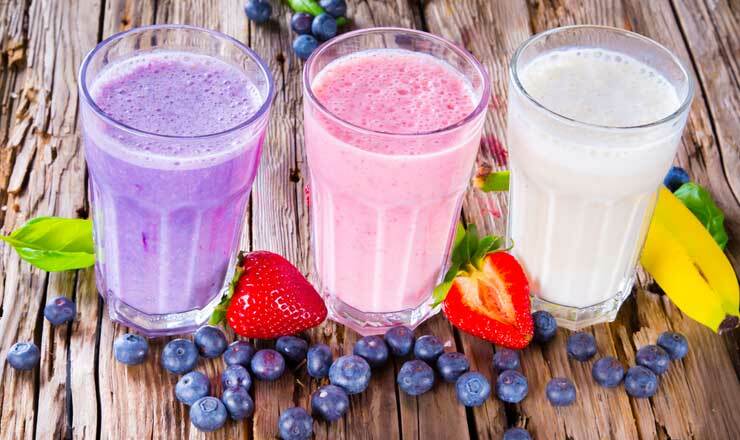 So which of these smoothies will you try? Write your answers in the comment box! 3 new katayef filling ideas you never thought of!